All wounds should be thoroughly cleansed with tap water or normal saline. Long-term corticosteroid therapy, the elderly. 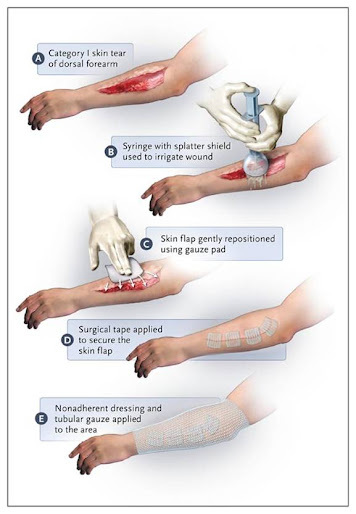 Category I tears (without tissue loss), the wound edges can be approximated with surgical tapes, and the area covered with a non-adherent dressing. Category II skin tears (partial tissue loss) and category III skin tears (complete tissue loss) can be managed with absorbent dressings such as petroleum-based gauzes, hydrogels, foams, hydrocolloids, nylon-impregnated gauzes, and silicone-coated dressings. Superficial infection rate (i.e., cellulitis): 2-10%. Most of the infections are caused by Staphylococcus aureus or Streptococcus pyogenes. Cleansing alone may be adequate therapy and antibiotics should be administered immediately in patients who have signs and symptoms of infection. If foreign body is suspected, CT or sonography should be used to detect non-adiopaque objects. The incidence of osteomyelitis (in most cases caused by pseudomonas), chondritis, and septic arthritis is considerably lower, antibacterial agents (e.g., dicloxacillin and ciprofloxacin) should be used. After high-pressure irrigation of the wound, it is safe to close most bite wounds up to 12 hours after injury (healing by primary intention). Puncture wounds and scratches should be allowed to heal by secondary intention. For large, heavily contaminated lacerations, delayed primary closure, after an observation period of 3-5 days (healing by tertiary intention. Human bites that are sustained over the MCP joints ("clenched-fist bites") are especially prone to infection. These bites require aggressive irrigation and treatment with antibiotics (e.g., amoxicillin–clavulanate) and should not be closed. In the past, for hematomas involving more than 50% of the nail bed, many physicians recommended removal of the nail and repair of any underlying laceration of the nail bed, since the incidence of underlying lacerations was found to be quite high. Simple nail trephination with the use of a handheld portable cautery is recommended for most subungual hematomas. Do not routinely replace the nail plate or put other materials, such as aluminum foil or gauze impregnated with petrolatum, to separate the nail fold from the nail bed unless there has been a serious injury that requires surgical repair. Cooling of burns with the use of cold (15-25°C) tap water within 30 minutes should continue until the pain is substantially reduced or resolves. Intact blisters healed faster and were less likely to become infected than blisters that were ruptured. Removal of the necrotic epidermis slowed reepithelialization and increased the rate of infection and scarring. Blisters larger than 3 cm in diameter and those over mobile areas usually rupture spontaneously and may be aspirated under sterile conditions. 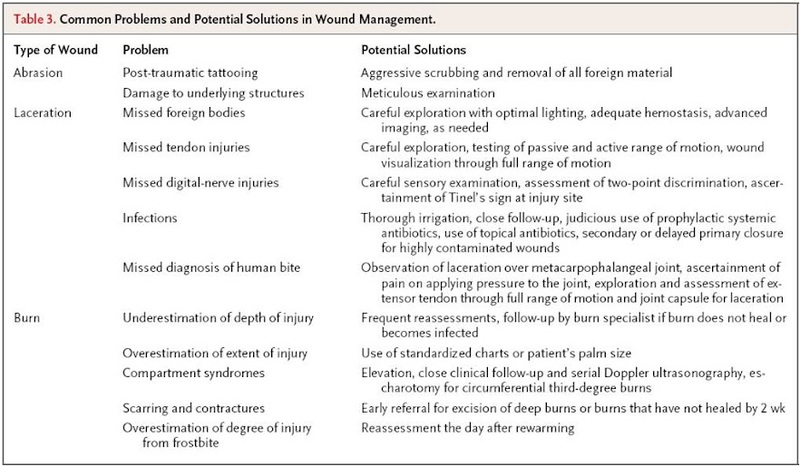 When blisters rupture, the wound should be washed with soap and water, and the nonadherent necrotic epidermis carefully removed. Exposure to HF leads to intense pain and tissue damage. Treatment includes copious irrigation followed by the application of calcium gluconate gel or subcutaneous injection of calcium gluconate, with the goal of relieving the pain. A burn from HF that involves >5% of TBSA, or >1% of TBSA if the concentration of hydrofluoric acid >50%, requires admission for ECG monitoring and serial measurements of calcium levels, since life-threatening arrhythmias and hypocalcemia can occur.